Can Adjusting Your Side Mirrors Eliminate Blind Spots? Your rear-view and side mirrors are some of the most important safety tools your vehicle has, allowing you to easily stay aware of the road behind you. Since each driver is different, knowing how to adjust side mirrors and the rear-view mirror to fit your own point of view each time you get behind the wheel is essential. Positioning the inside rear-view mirror is pretty straightforward - it should be adjusted so that you can see your entire rear window from the driver’s seat. But knowing how to adjust side mirrors is a little trickier. As new drivers, many of us were taught to adjust them so that the side of the car is just barely visible in the inside corner of each mirror. This setting has the advantage of providing a continuous field of vision between your rear-view and side mirrors. 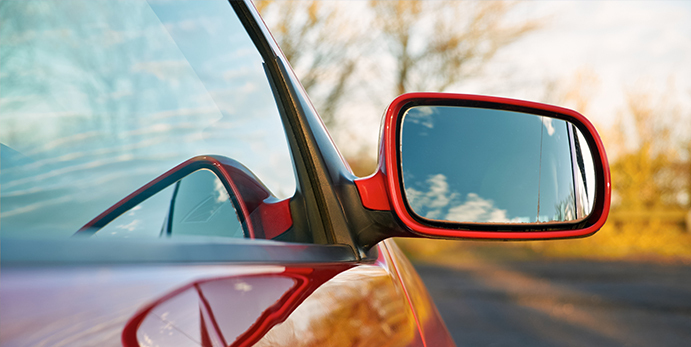 But in this setting, the side mirrors don’t add much coverage to what you can already see in your rear-view mirror. And you still have a big blind spot on each side of your car. Could there be a different way to position them? As it turns out, there is. It’s called the Blindzone/Glare Elimination Setting or BGE Setting, developed by the Society of Automotive Engineers in 1996. This setting has its pros and cons too, so here’s how it stacks up against the traditional setting! The basic concept is to rotate the side mirrors outward to look directly into your blind zones. By doing so, this setting reduces the overlap between your side mirrors and your rear-view mirror and allows you to see a more of the total area around you in your mirrors. A Simple Way to Prevent Blindzone Accidents - George Platzer, SAE International, 1996. This “wide” setting creates four smaller blind spots, which in theory would be too small to hide a car. An added benefit of this setting is to eliminate headlight glare from your side mirrors during night driving. The Society of Automotive Engineers provides a brochure detailing how to use the BGE Setting, and the radio program Car Talk provides an easily printable step-by-step guide to adjusting your mirrors. The SAE urges drivers to check that the blindzones are truly eliminated by watching cars as they pass you. A car should appear in your side mirror before it leaves your rear-view mirror, slipping seamlessly from one mirror to the next. Drivers must also use caution as they adjust to the new setting. Proponents argue that the BGE Setting should allow you check your “blind spot” with just a glance in your side mirror, eliminating the need to take your eyes off the road in front of you to look over your shoulder. But since motorcycles, bicycles, and pedestrians can still be hidden in these smaller blind spots, setting your mirrors “wide” cannot replace turning your head to look over your shoulder. Furthermore, the BGE Setting may not always be appropriate, for example when your rear window is blocked by cargo. This setting may also prevent you from seeing into the blind spot directly behind your car, which may be quite large in some newer cars and trucks. Have you tried using the BGE setting or any other method of adjusting your side mirrors? Did you find it difficult to get used to the new setting, and do you think it gave you better visibility? Erase your traffic ticket fast and easy with America's #1 Traffic School course.